1. I do not see any yellow or red anywhere. 2. I do not see any fanny packs ( or whatever you call them) with red and yellow. 3. What amazes me is that they are not in a rush. They are very calm, especially in the cars. 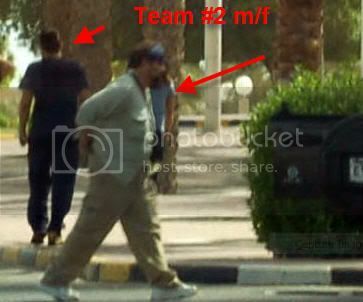 If these pictures are in fact of AR10. WHow. Its been a long time. I am so happy, Cannot wait till Sept.
One more thing, 7 cars, does not mean 7 teams, Maybe 2 teams where ahead, and this guy did not take pictures of them. 3 sets of Boys Teams [God Help Us All] however the ones with he blue bandanas i thought were production but i feel they might be a team. Team in Yellow matching T-Shirts ? 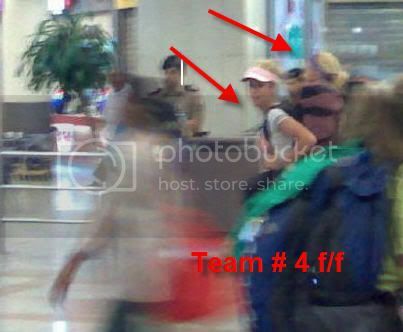 Assumes they are together m/f team #5 per tag . 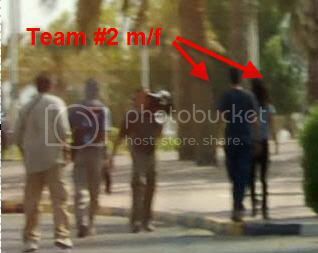 Too bad that the guy in Kuwait didn't use his Nikon D50 for the inside shots as he did for the exterior shots! 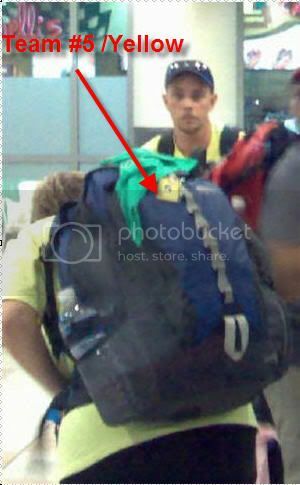 The camera phone was a Nokia 80 (not the best of the best)! 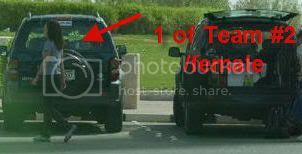 Could we call them Team # 1 for the sake of argueing ? Well teh m/m team doe snto look like they are in a rush and there looks like alot of other cars. So either they are first or they put extra cars there to throw off the racers. 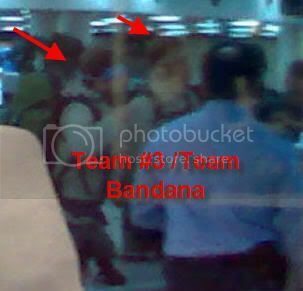 Team # 3 m/m Team Bandana OR ( as noted by the members ) camara men for sure ! 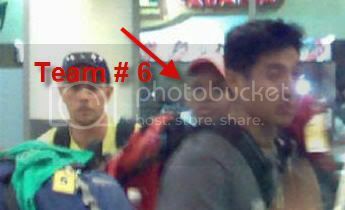 An Asian team #7 ? 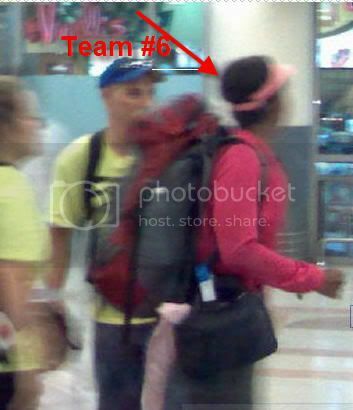 a black team #6 ? I agree Kogs -- also, as to someone's post earler about why they're not in a rush... 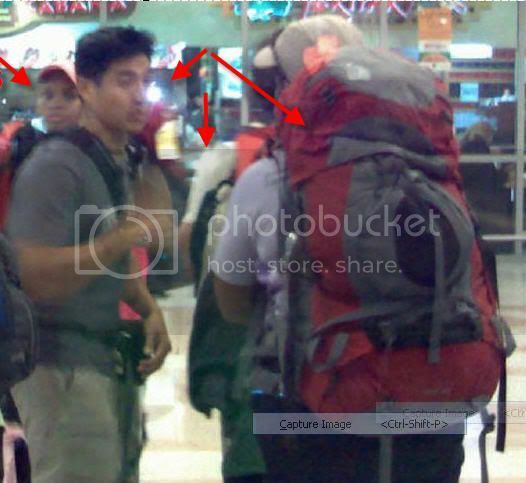 I'm guessing these shots are during the mandatory waiting period while other groups clear customs. They can't go yet, so they're hanging out. Temps this week in Kuwait are topping out at 114 degrees a day. But hey, it's getting down to 90 at night. Guh. This picture was taken between 8:45 and 8:53 am (assumes June 8, 2006). Solar azimuth 88 plus or minus one degree. 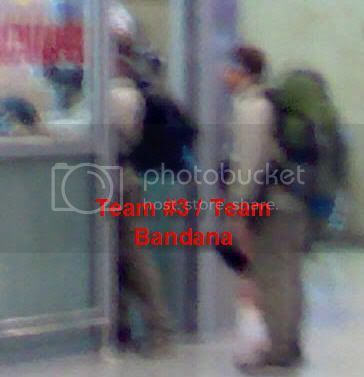 Team Bandana has to be crew becuase in shot they are holding a camera and then when we see the Pinkies backpack sticking out of a door he is holding the sound thing. 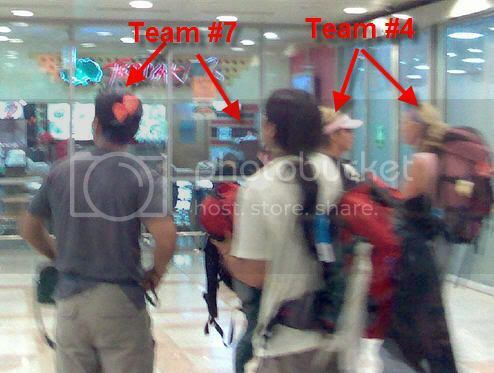 And Team "7" the guy in the blue shirt is the same guy as the one next to the Pink Black lady. 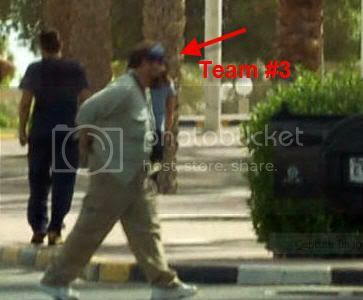 Team Three: Bandanas are crew and production. No " Old Teams " ? Chateau as always !! You rule !! 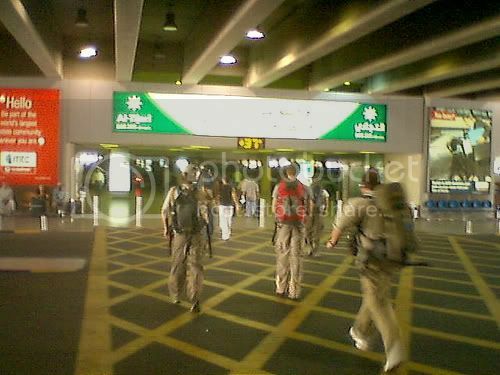 Arabic is needed, as some of the locals don’t speak English at all—unlike other gulf states. Formal. Modest dressing is preferred for women, though they are not as conservative as the Saudis. Islands with Failaka island being the most interesting . Nice finds, everyone. I appreciate the potential spoilers and can't wait to see more when the time arises. Keep up the good work! 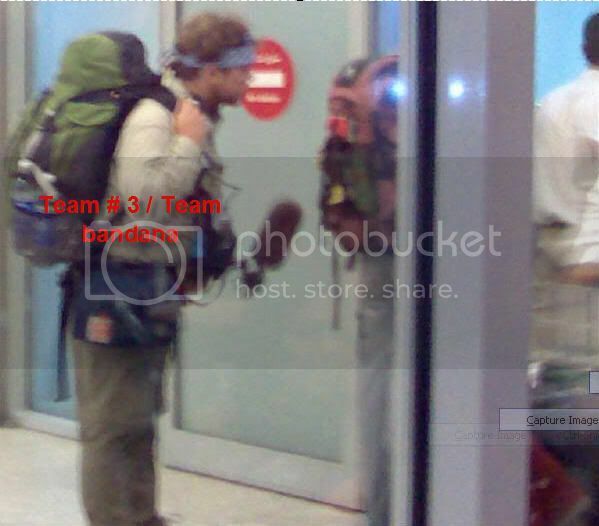 And yeah the bandana boys sure look like sound/camaramen . Here are likely flights that arrived. I screened for Thursdays (June 8th) and at or before 9 am. 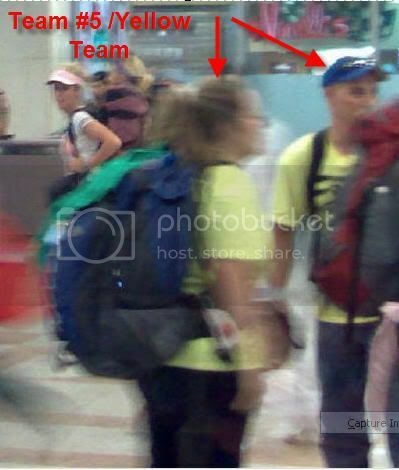 I'm using the posting date of the pictures thinking that the camera date may have been wrong. Slowhatch, You may want to pull that link. I was at their site earlier today, to make the above list, and my Symantec detected a virus. I cleaned up everything and rebooted. Now, just after using that place again (your link) I get the same virus warning. Somekind of "bloodhound " virus. Otherwise, it was a very useful site! chateau thanks for the warning. thats weird my symantec didnt pick it up and its up to date. using other scans to see if i got it. I did a quick scan with Trend Micro but didn't discover anything. Better to be safe, though; I've deleted the post and I apologize for any inconvenience. WOW you guys are awesome...lots of finds!! Can't wait until the new season starts. 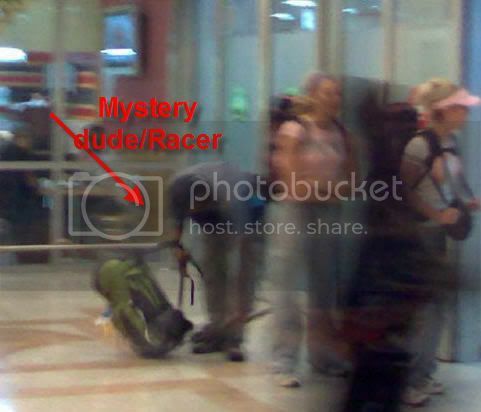 When TAR8 was in Toronto I saw some people and didn't think anything of it because there just seemed like TOOOOOOOOOOO many people duh FAMILIES!! I'll keep my eyes peeled although I highly doubt theyd come back to Toronto anytime soon.